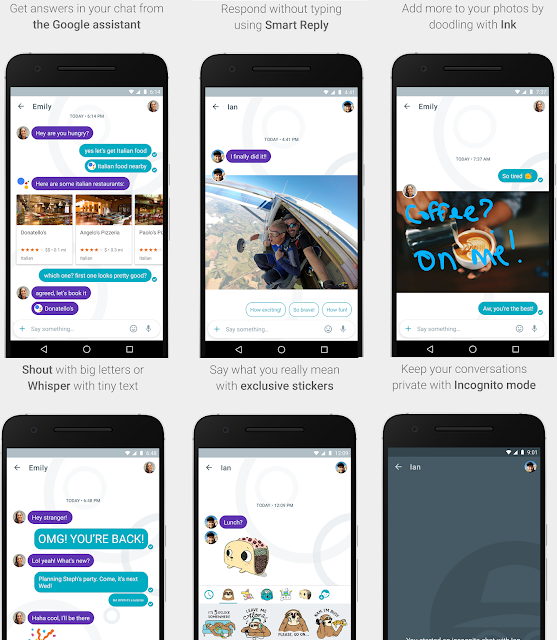 At Google I/O 2016 developers conference, Google has released the all new messaging application with some unique features and functions, as compare to its default Android messaging app and hangouts app. Google Allo for Android is what we are talking about here, that comes with built-in Google Assistant, a direct competitor to Apple Siri and Microsoft Cortana. The Direct Download Links of Google Allo APK for Android Smartphones and Tablets are available below. More convenient, more expressive, and more productive to make conversations easier. Powered by all new built-in Google Assistant to provide useful information and relevant answers to get things done without ending conversation and messages. Integration of Smart Reply feature, to respond your messages without typing a phrase and word. It suggests relevant replies based on users historic conversations in user’s personal style. It also answers to photos and texts to never end conversation. Inclusion of Ink function, to make you more creative with photos by making doodles. With a quick swipe option, users can highlight points without TYPING IN CAPSLOCK. Addition of Stickers to make you more expressive, all new stickers are exclusive and developed by various studios and artists from all over the world. With Incognito Mode, users can privately chat with friends, family members and office colleagues with end-to-end encryption, users can also get the option to mark messages long and short with the expiry period. It also provides private notifications to users to maintain personalization and privacy standard. Allo by Google, is officially available on Google Play Store, and as well as via third party links provided at the end of this post. Before manual installation, Android users ensure to activate security option says; "Allow installation of apps from unknown sources" under settings.